Any experienced marketer knows that their job doesn’t just end at developing ads and marketing campaigns for their clients. You also need to monitor the performance of these campaigns and most importantly, monitor how the brand is being perceived in general. Constant brand monitoring helps you get a better idea of where your client’s brand currently stands. It also helps you identify scopes for improvement, take remedial actions, provide better customer service, and develop even better campaigns. This post will provide you with a comprehensive field guide to brand monitoring for marketers, so you can expand and improve your service offerings. Before you can start your brand monitoring efforts, you need to have a clear idea of what to monitor. Branded Keywords – Most marketers typically measure brand names and product names, which is the most basic level of brand monitoring using branded keywords. Other than that, you can also monitor iterations of the brand name or even possible misspellings. You can further expand your list of branded keywords with branded hashtags on social media, marketing slogans,and phrases, etc. You might even have campaign-specific slogans and hashtags that you need to monitor. 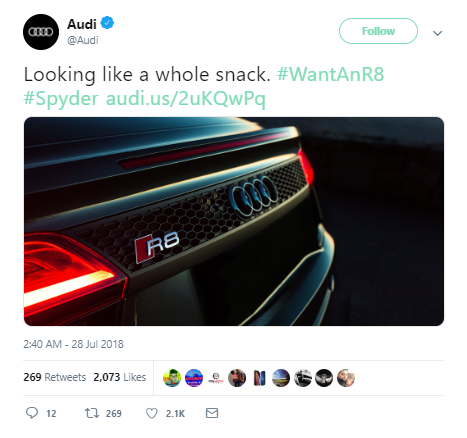 Take for example the #WantAnR8 campaign by Audi, the #ShareACoke campaign by Coca-Cola, and the #WorthSaying campaign by L’Oreal Paris. All of these campaigns have a unique hashtag relevant to the respective brand and its purpose. Monitoring the performance of these hashtags can help brands understand how their campaigns are performing. Brand Leaders and Public Figures – For a lot of brands, leaders and executives act as the faces of the brand. Take for example how Steve Jobs was the face of Apple and Elon Musk publicly represents Tesla. So if the brands you’re working with have leaders who are highly visible in the public eye, it will be necessary to monitor their names as well. What people say about them can give you a better idea of how people perceive the brand. It can also help you discover opportunities to engage with the community by answering questions and resolving customer issues. Trending Topics and Discussions – While brand monitoring is ideally focused on the brand in question, it’s also important to monitor trending topics and discussions in the industry. This can help you identify any upcoming competitors or discussions you can participate in. You’ll also be able to understand trends that you can use for building successful campaigns that will resonate with your target audience. 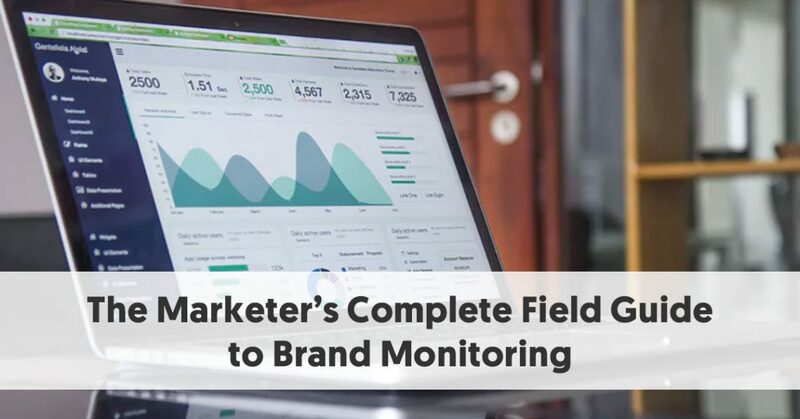 Now that you have some idea of what you need to monitor, let’s find out how you can use brand monitoring for your clients and how to execute it. One of the most popular uses of brand monitoring is for reputation management. This may involve monitoring feedback and reviews across various virtual platforms and responding to them in a timely manner. 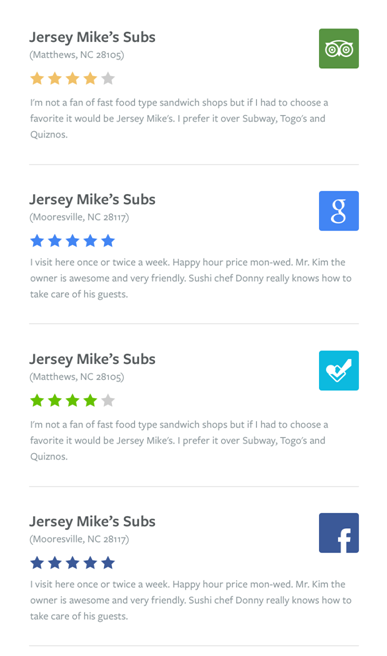 This will help you improve the experience of customers who left those reviews. It will also help you leave a better impression on potential customers who are researching the brand. The Harvard Business Review found that responding to customer reviews can help brands achieve better ratings. They analysed reviews on TripAdvisor and found that hotels get 12% more reviews and get an average increase in ratings of 0.12 stars once they start responding to customer reviews. About one-third of the hotels in their study managed to have their ratings increased by half a star or more. These results were visible within six months of starting their management response efforts. They also found that users who received management responses gave higher ratings by approximately 0.1 stars compared to users who didn’t. Additionally, a BrightLocal survey found that an impressive 97% of consumers looked up local businesses online during 2017. And 30% said that they mostly judge local businesses from the way they respond to reviews. Brand monitoring offers you the opportunity to discover these brand reviews. This will enable your clients to respond to them and/or implement feedback as needed. It’ll give them the chance to provide disgruntled customers with relevant solutions while thanking their fans for their support. This can increase customer loyalty while showing potential customers that their brand is listening. Take for example how the Baby Elephant Boutique Hotel in Cambodia responded to customer reviews. You’ll need to make sure that your client has an active profile on relevant review sites. This could be Yelp, TripAdvisor, Foursquare, etc. depending on which industry your client is in. Additionally, you should ensure that they have a proper Google My Business Page where they can see and respond to Google+ reviews. To simplify the process of monitoring reviews, you can also use platforms like ReviewBot or ReviewPush. Both of these platforms allow you to monitor your reviews across various channels using a single dashboard. You can set up email alerts so you’ll be able to quickly act on important reviews. Another popular way brand monitoring can help brands is by analysing people’s sentiments towards them. You’ll be able to get a clear idea of how people feel about your client’s brand. Are they happy with the products they’ve purchased? Have they had any brand interactions that upset or appeased them? Is your client winning or losing people’s trust? Brand sentiment analysis mainly helps you understand where your clients are standing in terms of trust and reputation. Using this information, you can help them develop campaigns and strategies to further improve their performance. There are many social media management tools that come with a sentiment analysis feature. You can also use free tools like Social Mention to conduct a search for the brand name or relevant branded keywords. This tool will analyse the brand mentions across various platforms and bring up results in the form of sentiment ratio, strength, passion, and reach. You can further narrow down the search based on date and sources for more accuracy. Brand monitoring is a great way to keep track of the competition on behalf of your clients. You can run a sentiment analysis, but this time, using the competitor brand name and keywords. This will help you understand just where they stand in comparison to your clients. If they’re performing better and doing something right, perhaps you can discover strategies and tactics that your client can apply. And if they’re making mistakes, you might be able to find out what they’re doing wrong so your client can avoid following in their footsteps. You might even be able to jump in and provide a remedy to the competitors’ disgruntled customers. 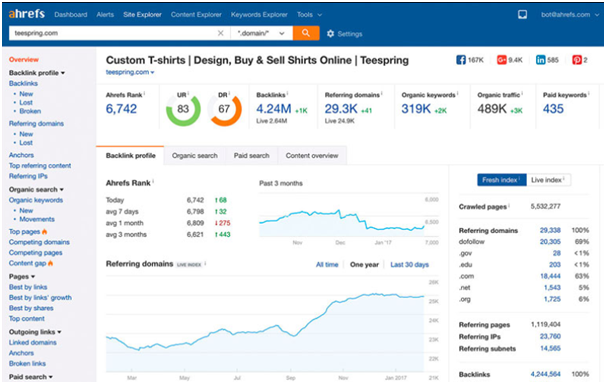 Aside from Social Mention, you can also use Ahrefs to conduct competitor research. This will help you monitor the competitors’ performance in terms of rankings and referring domains. So you can get a clear idea of how far off your client is and then develop a strategy to get ahead of the competition. One of the best uses of brand monitoring is to discover opportunities to engage with customers. Not everyone who talks about your client’s brand may tag the brand or leave a comment where you can get notified. Instead, they may write blog posts or create social media posts talking about their experience with the brand. Brand monitoring helps you discover these mentions and discussions. This is crucial because you can jump in and participate in these conversations, which can, in turn, improve customer engagement and brand sentiment. 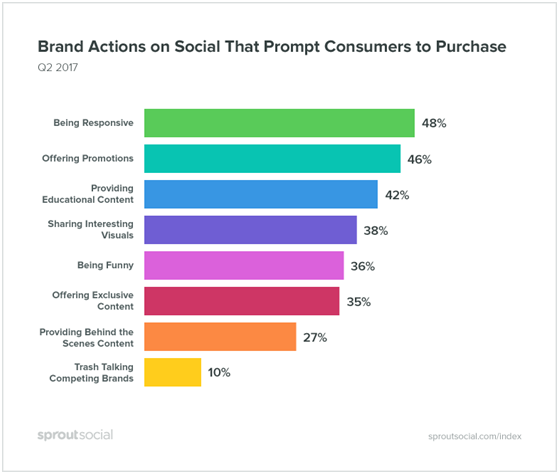 Sprout Social found that being responsive is the number one brand activity on social media that prompts consumers to purchase. So there’s a good chance that your brand monitoring efforts can improve responsiveness, which can increase sales. By quickly responding to customers’ social posts, you can ensure that your client is at the top of their minds. Have a plan to thank customers who talk positively about the brand or even share their posts. This will ensure an even better experience for brand ambassadors and increase brand loyalty. It could even compel other customers to create more content about the brand, which increases visibility and raises brand awareness. And in case of any negative posts, you should create personalised responses to handle the complaints before things get out of hand. This will ensure that you put out the fire before it spreads and turns an unhappy experience into something more memorable. It will also show potential customers that your client pays attention to their customers and resolves their issues. Platforms like Brand24 are perfect for discovering brand mentions and conversations about brands. It gives you real-time updates on comments and social posts made about the brand so you can follow up on accordingly. 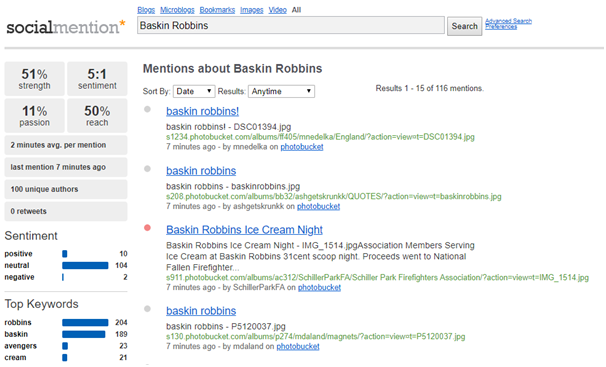 You’ll even be able to monitor competitor social mentions, which will further help in your competitor research efforts. These are some of the best ways you can utilise brand monitoring to help your clients achieve their goals. You’ll be able to discover missed opportunities for engagement and customer issue resolution. And the insights you collect will help you and your clients develop better, more effective campaigns that will resonate with the target audience.